I think my mom might finally actually trust my baking abilities. This Easter I have been assigned the task of making “my father’s cookies” as my mom likes to call them. To everyone else they are Egyptian shortbread cookies, traditionally (at least in my family) stuffed with a date filling. When I was a kid I hated the date filling, it looks like chocolate but it’s not chocolate. That’s very upsetting to a child. To appease my anger, my mom also started making nut filled cookies just for me. The problem? All of the cookies looked exactly the same. Biting into a date filled cookie when I was expecting walnuts was also very upsetting. Now that I’m a little older (ok, a lot older) I’ve learned to appreciate dates, so I made both versions of the cookies. My personal touches? Two different shape for easy identification, and almonds instead of walnuts due to some recent face swelling experiences after eating walnuts. out these, but I think I did a pretty good job. I used too much dough in the first few cookies while trying to figure out how to properly shape them, but still managed to get over 50 cookies from the recipe. It turns out the secret is to really press the dough into your palm before putting the filling in. That way the dough can easily be wrapped around the filling to make the crescent shape. It’s important to have a good filling to dough ratio. You may have noticed there is no sugar in the dough, so all of the sweetness comes from the filling and the icing sugar on top. I used vanilla instead of rose-water, because rose-water isn’t something I keep in the house. If you do want to make the cookies with rose-water keep in mind that it has a very unique flavour. A whole tablespoon can be over powering to those who aren’t used to the flavour, it makes the cookies a little perfume-y. I think flavouring the cookies with orange rind would also be very tasty. That’s an experiment for another day. I love those date-filled cookies, but somehow have only made them once! They look perfect! 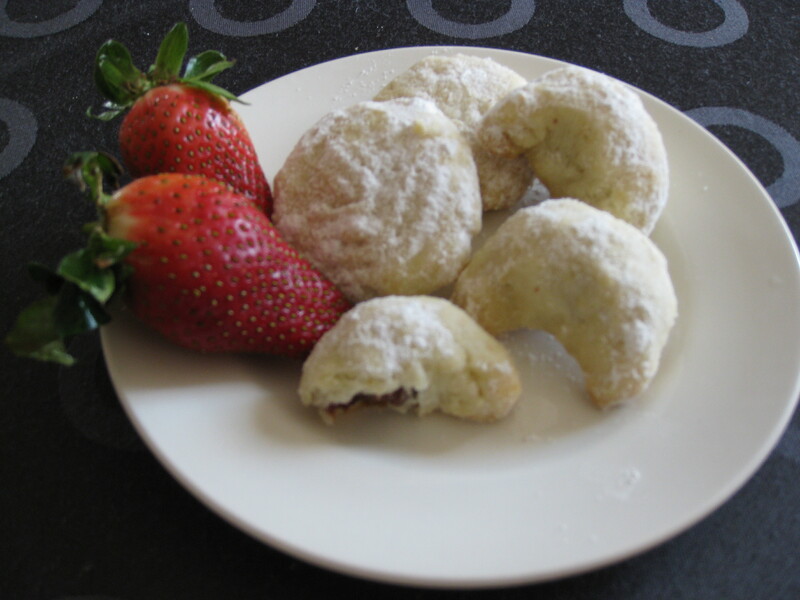 Hello, I have been searching for the recipe of the Egyptian shortbread filled with the dates as in the picture above. It is a favourite of my families and my mother passed away without us having a written recipe. If you can assist I would like a copy of the recipe and instructions on how to make. I have a recipe from my friend who was born in Egypt and came here as a young girl. If you are interested, please email me. I am looking for the little tin pinchers for making the herringbone design on top of the cookies. Can you help?